Clearly the global solar panel industry has grown at a rapid rate over the last few years with Germany leading the way. However, the next step of this rapidly evolving market is how to manage the surplus power that our solar panels are generating. It seems logical and sensible to consider that Electric Cars are the ideal solution to such a predicament. In the past an Electric Car was considered something of a novelty and never a serious contender to fossil fueled vehicles. Today the idea of 1 in 5 electric cars being on the road come 2030 (an IHS Global prediction) is beliveable. According to Bloomberg there is currently an over supply of electric car batteries equivelant to 10GWh or 400,000 Electric Cars. This over supply is seeing the costs of these once hugely expensive batteries fall. In addition; thanks to investment and growing competition the efficiences of these products is fast improving. Therefore, with the ever reducing costs of production, improving efficiencies/performance and growing competition. We are quickly making our way towards Electric Cars competing with traditional fossil fueled vehicles. Solar Panels and Electric Vehicles; The Dream Team? Many people who have installed solar panels know that often in the middle of the day when your yield as at its best you tend to generate more solar power than is required on site. Therefore, we need a way of effectively storing this power for use at another time. The Electric Car is an ideal solution for this. Your home can be fitted with an electric car charging point which can then send any surplus power into your Electric Car’s battery. This should remove the odds of any oversupply from your solar panels, thus allowing you to make the most of your solar panels yield. Looking at the bigger picture, Australia has huge areas of car parks for instance that are essentially a neccesary but waste of space. 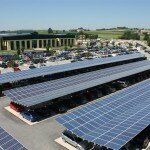 However, if these carparks were fitted with a solar panel roof (making it a solar carport), an entire fleet of electric vehicles could be charged with both green and free electricty. This has to be the future when we consider the growth of the solar industry and the potential of Electric Vehicles. 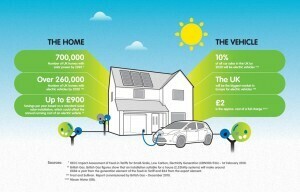 Robert Llewellyn recently completed a video article on the potential of teaming up Solar Power with Electric Vehicles. Previous post: Quasi-mono Silicon Solar PV Panels?